As some of you may have heard, the Baltimore City Council recently voted unanimously to pass the Clean Air Act. Mayor Catherine Pugh votes to pass it and has stated repeatedly that If you’re interested in the more technical aspects of this bill, that several news outlets have covered it in detail. I would recommend Dharna Noor’s coverage for the Real News Network, which can be found here, and Clean Air Baltimore’s coverage, which can be found here. Instead, let us focus on what implications the passing of this bill has on climate justice and environmental health in our city. 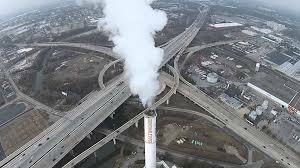 As it currently stands, this bill’s passing will require Baltimore’s high volume trash incinerators to either meet stringent standards to reduce the number of toxins they emit or close down by September 2020. Considering how much waste is currently put into the air (and thus the soil and water) as a result of these facilities, a decrease of any amount will mean an improvement in our city’s air quality. For those of us with asthma or other breath-related issues, this may result in less strain on our lungs and throats and possibly fewer attacks. Even for those of us without asthma, we can look forward to our city’s air being cleaner, which in itself is a massive improvement. When we consider that both facilities are located in low-income areas, the positive impact becomes even more significant. We at BPCM know that all too often, neighborhoods, where the majority of residents are low-income and/or people of color, are the very ones that developers choose to place their toxic waste sites. In 2017 in East Oakland, the most racially diverse and lowest income part of the city, a company called the Neptune Society quietly opened a crematorium after getting a permit from a governing body that is meant to address air quality issues. That is just one of many examples which support my previous point. Here in Baltimore, the two largest trash incinerators are located in Curtis Bay and just south of Pigtown, both low-income POC neighborhoods. While I won’t speculate about the motives behind the choice of location, it is pretty clear that low-income POC communities are most at risk when it comes to development decisions that pose an environmental and physical health hazard. When a low-income family or individual becomes ill as a result of the toxic air they regularly breathe, getting medical treatment is not always easy. There are many barriers one would face to treat what ails them; most often people just due to not having the money that is needed for medication or hospitals visits. Especially when faced with other financial demands such as paying for housing, food, transportation and the care of loved ones. This results in a decreased ability to treat their illness, which only leads to further physical, economic and social disadvantage. When we see a tower spewing out white toxic clouds, how many of us think about where that cloud is spreading to? Or what impacts the contents of that cloud will have on the lives of the many strangers around us? Some see it and think it looks kind of pretty (I have actually heard this many times on the bus). Others think nothing of it, continuing about their busy lives. Others still argue that the significance of these toxins is nothing compared to the toxic gas coming from cars, trucks and other vehicles that pass through our city daily. While it is true that no one; individual, company or country is solely responsible for the mass amounts of greenhouse gases in our atmosphere, it does not mean that we should continue to pollute just because everyone else is doing it recklessly. If we are all to blame, then we all need to be a part of the solution, no matter the size of our footprint. For those not familiar with the term “footprint,” it is often used in environmental circles to describe the impact that an individual or nation has on the changing of the earth’s climate and ability to recreate its resources. As we wait another week or so for the Mayor to make her final decision on the Clean Air Act, we can rejoice in knowing that our city council has heard the call from us, it’s constituents, to make climate justice a priority. We are hopeful that this will set an example for other governing bodies to follow, and will work to continue holding them accountable to our needs. So many activists and organizations have fought for years to make this happen, and for that, they deserve a mighty THANK YOU. We see you, and your struggle has not been in vain. This is one step further in shifting toward a healthy environment and economy that centers the wellbeing of the living over that of corporations. Onwards!